Do you struggle to bring people out of the process and into the classroom? Do the specific how-to lessons get lost before someone gets a chance to apply them? Do your lean experts spend time coaching in the aisle, hallway or offices? Are your front-line managers prepared to answer questions and engage people on lean topics? These are challenges that most companies face throughout a lean journey, but few solutions exist to overcome them. Single Point Lessons can help. 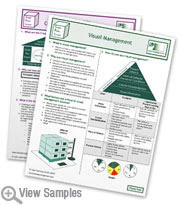 Single Point Lessons are a volume of one-page structured teaching tools. Each one covers a different lean principle, tool, or concept clearly and succinctly. Each one of the more than 60 Single Point Lessons covers the four primary questions: what is it, why would you use it, how does it work, and what factors are critical to be successful? By following this standardized approach, you will deliver a consistent jargon-free message that is actionable and answers the key questions that people might have regarding the lesson. The Single Point Lessons are color-coded across four categories. The first section is Lean Rules and Principles, which covers the beliefs and behaviors central to lean. The second category is Process Tools, which covers a wide range of improvements to your processes. This includes well-known tools such as 5S and Five Whys as well as lesser known topics including RACI Charts and Training Within Industry. The third category of Single Point Lessons is the underlying Concepts critical to lean success. This includes ideas such as Help Chain, Creative Tension and the Operating System. The fourth category is Change Management and Improvement Tools. This includes everything from process improvement tools such as Kaizen Workshops to organizational change methods like Cultural Assessments. The entire set of single-point lessons is available in Spanish. For an additional fee you can benefit from this enhanced offering! We will also help you with edits or in the creation of additional company-specific lessons for a fee based on the scope of the project. Please call to inquire into this option.